For Steve’s talk “St Paul’s Last Days” click here. For Fr. Mattson’s Homily at the martyrdom side of St. Paul, click here. Part Two as we visit the site of St. Paul’s martyrdom in the place of his burial. When I was 17 or 18 I began to experiment with drugs, mostly Marijuana but also occasionally heroin. Around the age of 23, though, I became a daily user of heroin. It could cost up to hundreds of dollars each day, depending on how much I could afford at the time. This was to be my dreadful situation for the next 15 years. At the end of that period I was using the far cheaper methadone instead of heroin, but the effects were the same and I would have seizures if I didn’t get my “fix”. Around Christmas of 2003 I developed an abscess in the groin where I had been injecting, and I ended up in hospital. Soon the abscess burst and I developed deep vein thrombosis, septic arthritis and golden staph. I was given antibiotics for the infection but the pain was excruciating. Between the illness and the pain I was unable to eat anything and over the next two to three weeks I lost over 30 Kilos. I was effectively slowly dying. When I was getting very low, the hospital chaplain came to see me and, after many years, I went to confession and received the anointing of the sick. The next day I became delirious and began to rant and rave. I felt as though the devil was coming for my soul. That night I had a Seizure and fell out of bed, even though it had railings. About an hour later I had another seizure, with vomiting which I inhaled, causing aspiration pneumonia. My condition became critical and I was transferred by helicopter to another hospital which had an intensive care unit. There I remained in a coma for several days. At some point during that time I was clinically dead. I felt that my soul left my body and passed through Purgatory and its suffering souls into a bright light where I saw the Blessed Virgin Mary and Jesus. I also had a Vision of my sister praying to Our Lady for me. During all those years, my mother and sister never stopped praying for me to end my wayward life and come back to God. When I woke up from the coma I was on life support and there were tubes down my throat. But for the first time in many years I felt the peace and love of God, along with a sense of shame for my past life. One day I had a vision of Jesus being born and through that I was being reborn to the life of grace . In addition, my addiction was gone so that, when the doctors offered me methadone, I declined and felt no ill effects. Slowly I began to eat again. Even though my body was very weak and I drifted in and out of consciousness, my spirit was strong. I was in Hospital until the end of February and when I left, the doctors told me It would take five to ten years to recover fully. Since then I have slowly regained my strength. Now I am able to attend Mass each day. I participate in a weekly prayer group long with my mother and sister. 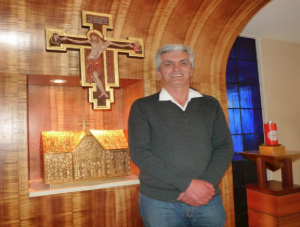 I am a catechist and I teach Catholic scripture at Lidcombe public school once a week, I do all I can to help others grow in faith, so that they do not have to go through what I did. I give thanks to Jesus for bringing me back from such a desperate lifestyle in which I could very easily have died very far from Him.